What about your analysis is “real”, i.e. what will you save as your lasting record of what happened? Where does your analysis “live”? As a beginning R user, it’s OK to consider your environment (i.e. the objects listed in the environment pane) “real”. However, in the long run, you’ll be much better off if you consider your R scripts as “real”. With your R scripts (and your data files), you can recreate the environment. It’s much harder to recreate your R scripts from your environment! You’ll either have to retype a lot of code from memory (making mistakes all the way) or you’ll have to carefully mine your R history. 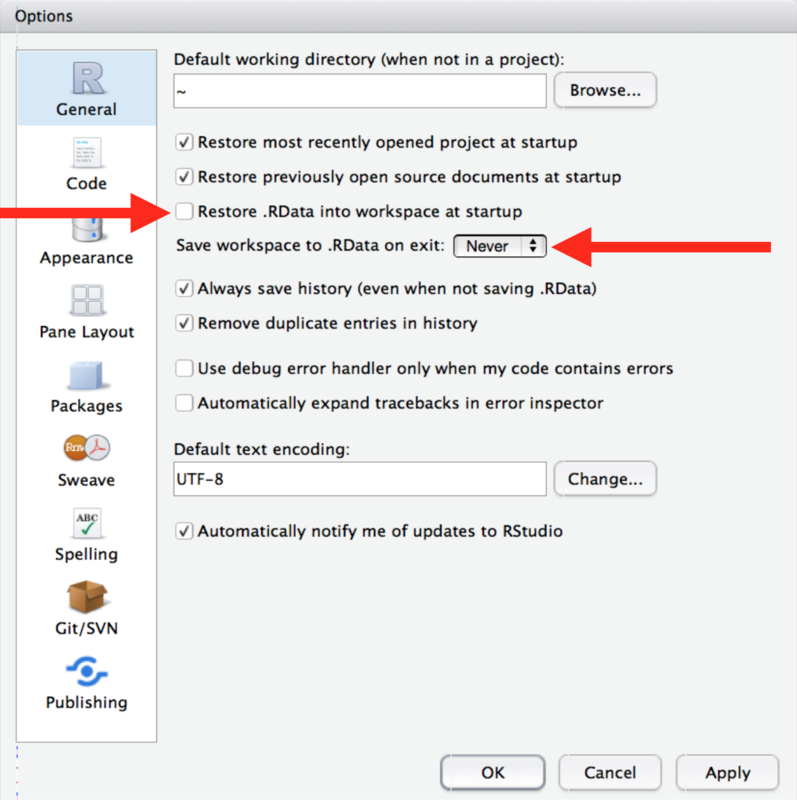 This will cause you some short-term pain, because now when you restart RStudio it will not remember the results of the code that you ran last time. But this short-term pain will save you long-term agony because it forces you to capture all important interactions in your code. There’s nothing worse than discovering three months after the fact that you’ve only stored the results of an important calculation in your workspace, not the calculation itself in your code. Press Cmd/Ctrl + Shift + F10 to restart RStudio. Press Cmd/Ctrl + Shift + S to rerun the current script. I use this pattern hundreds of times a week. As a beginning R user, it’s OK to let your home directory, documents directory, or any other weird directory on your computer be R’s working directory. But you’re six chapters into this book, and you’re no longer a rank beginner. Very soon now you should evolve to organising your analytical projects into directories and, when working on a project, setting R’s working directory to the associated directory. But you should never do this because there’s a better way; a way that also puts you on the path to managing your R work like an expert. The most important difference is how you separate the components of the path. Mac and Linux uses slashes (e.g. plots/diamonds.pdf) and Windows uses backslashes (e.g. plots\diamonds.pdf). R can work with either type (no matter what platform you’re currently using), but unfortunately, backslashes mean something special to R, and to get a single backslash in the path, you need to type two backslashes! That makes life frustrating, so I recommend always using the Linux/Mac style with forward slashes. Absolute paths (i.e. paths that point to the same place regardless of your working directory) look different. In Windows they start with a drive letter (e.g. C:) or two backslashes (e.g. \\servername) and in Mac/Linux they start with a slash “/” (e.g. /users/hadley). You should never use absolute paths in your scripts, because they hinder sharing: no one else will have exactly the same directory configuration as you. The last minor difference is the place that ~ points to. ~ is a convenient shortcut to your home directory. Windows doesn’t really have the notion of a home directory, so it instead points to your documents directory. R experts keep all the files associated with a project together — input data, R scripts, analytical results, figures. 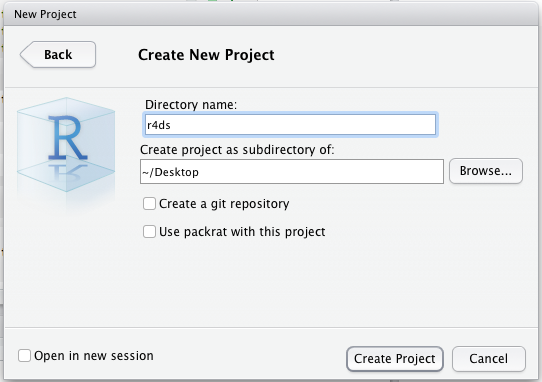 This is such a wise and common practice that RStudio has built-in support for this via projects. Call your project r4ds and think carefully about which subdirectory you put the project in. If you don’t store it somewhere sensible, it will be hard to find it in the future! Whenever you refer to a file with a relative path it will look for it here. Now enter the following commands in the script editor, and save the file, calling it “diamonds.R”. Next, run the complete script which will save a PDF and CSV file into your project directory. Don’t worry about the details, you’ll learn them later in the book. Quit RStudio. 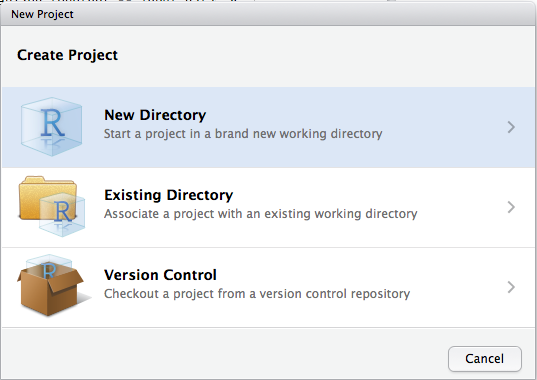 Inspect the folder associated with your project — notice the .Rproj file. Double-click that file to re-open the project. Notice you get back to where you left off: it’s the same working directory and command history, and all the files you were working on are still open. Because you followed my instructions above, you will, however, have a completely fresh environment, guaranteeing that you’re starting with a clean slate. In your favorite OS-specific way, search your computer for diamonds.pdf and you will find the PDF (no surprise) but also the script that created it (diamonds.R). This is huge win! One day you will want to remake a figure or just understand where it came from. If you rigorously save figures to files with R code and never with the mouse or the clipboard, you will be able to reproduce old work with ease! 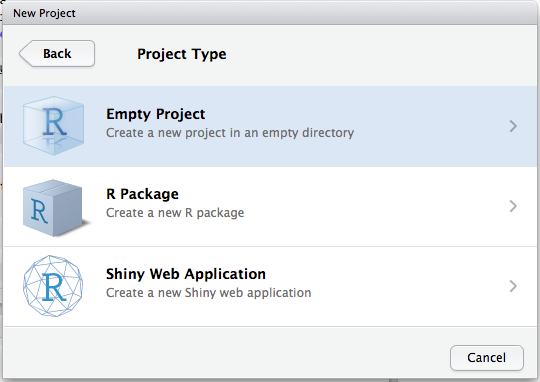 Create an RStudio project for each data analysis project. Keep data files there; we’ll talk about loading them into R in data import. Only ever use relative paths, not absolute paths.